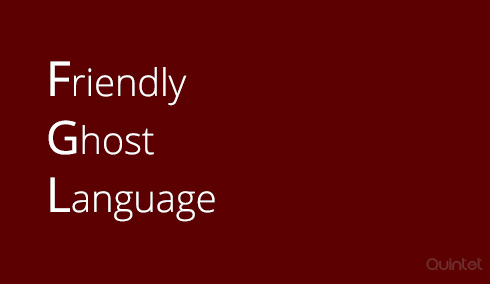 Friendly Ghost Language is a programming language that is used extensively to layout, customize contents that gets printed using various printers. FGL can be used to print text, image, barcode in the ticket/paper in different orientations. It has an HTML like syntax and uses a row and column structure to access different points in ticket. Using FGL, we can get control over the position, rotation, font and size of every single character that gets printed on the paper. It has commands that can convert text to equivalent barcodes of different size. It also contains convenient commands to draw basic graphical structures like lines or boxes. FGL commands are passed on to printer as plain text and therefore this language can be easily used with other high level application softwares to control the printer. FGL can be difficult to learn at first, but it gets easier because of its similarity with html. We have experience in using FGL from our mobile applications to drive printers. Infact FGL is very useful in that sense because it provides low level access to a dot, but can be used directly from a high level software like mobile application. We are familiar with how to layout content, print bitmaps and barcodes and even operate a cash drawer. We are also experienced communicating with printers using wired, wireless, bluetooth, usb, serial port interfaces. We are familiar with different FGL versions and we can do custom design for the page as well as align the contents for professional look. Want to Communicate with your printer , we can help you. We are familiar with driving different printers from high level softwares including mobile apps. We are also familiar with bluetooth (classic and LE), wifi, USB or serial printers and communication standards. Java is one of the most popular programming languages used by developers and runs on billions of computers, set top boxes, smart phones and other electronic devices. Quintet offers you mobile application development, web, desktop and enterprise application development services using Java. Flite is a small run-time speech synthesis engine developed at CMU (Carnegie Mellon University). Flite was developed from Festival Speech Synthesis System, the initial speech synthesizer. Quintet will help you to integrate Flite in iOS and android apps.